Hello there ! 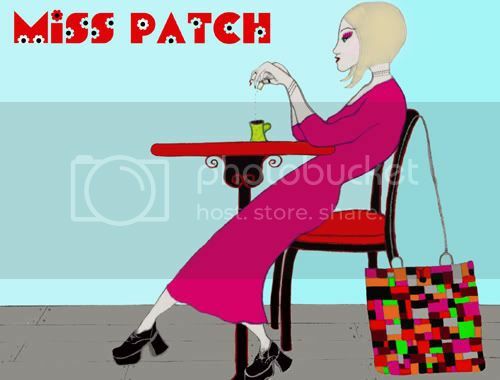 I am Miss Patch™.....a.k.a. Tiffany! 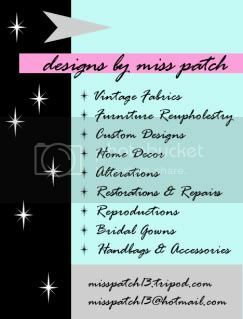 I am a Fashion Designer, Seamstress, Costume Designer, Specialize in Home Decor & I reupholster furniture. I have been a self taught sewing wiz since I was young, since I am rather on the short side, doing my own alterations & clothing making was always a must. I started making hand bags and back packs almost 20 years ago for friends and of course myself. This also grew into an internet, traveling to arts festivals and at home business. These days, I work in my home or I do travel in the Philadelphia & Suburb areas for all necessary sewing needs. Top Row: Black fitted babydoll shirt, flare dress in velvet, hand dyed corduroy patchwork back pack, drawstring loose fit babydoll top, & tapestry. 2nd Row: Sheer floral shirt, my striped hand dyed patchworked couch, & floppy burn out velvet hat. 3rd Row: Sheer bats over fushia satin zippered pouch with handle & brown denim bag with beaded cherries. Last Row: Denim patchworked coat, hand dyed red & green velvet striped bag called "Freddy", hand dyed velvets & silk scarf, hand dyed velvet & corduroy duffle bag & black gauze empire waisted dress. You may NOT save, copy or alter any images on this site without permission by me, Miss Patch™. All images, drawings, banners, photos and image manipulations were made by me, Miss Patch™. This may or may not apply to "My Cool Friends" on my site, you will have to contact them to use their artwork and banners. 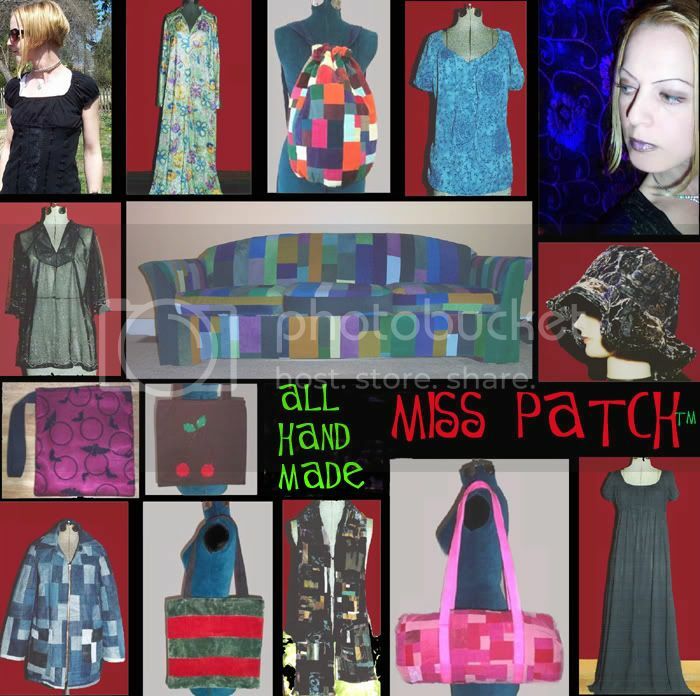 I do NOT work for other designers, I am the sole proprietor for Miss Patch. All rights reserved. Thank you very much for your understanding and I appreciate your support.